I am a self proclaimed product junkie. It’s gotten to the point where my lovely business partner has to basically put blinders on me when we go to the drugstore so I don’t come out w/ an unnecessary array of body oils, nail decals & lip gloss. Before we go in, she gives me a pep talk that normally goes something like this, ‘Stay focused, we’re here for toilet paper. Now, go get ’em champ’. One way I like to satisfy my urge is with trial sizes (my Sephora wishlist is filled with gift sets…that I will inevitably gift to myself). Trial sizes allow you to try lots of different products without spending a ton or making too much of a commitment. 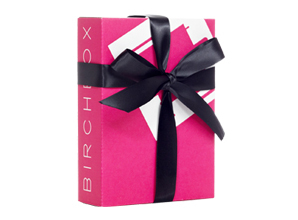 This is why I could not be more excited about my new BIRCHBOX membership!! It’s a membership in which every month you get a box of trial sized goodies tailored to your skin type, coloring and beauty style. Let the sampling begin!! Can’t wait to see if A. you like the assortment of products and B. this satisfies your drug store urges. If the answer if yes to point B, then I almost feel sorry for Duane Reade and CVS!